Can you explain me details about column to column connection? Column to column connection is called column splice and they are very common in steel structures. 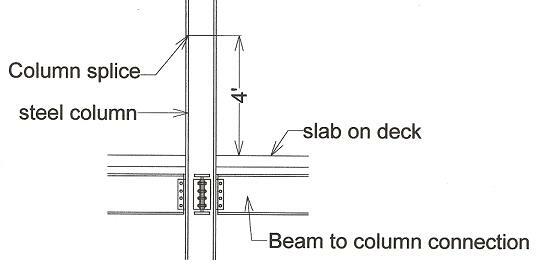 In order to avoid the interference with beam to column connections as shown in the detail below, the column splice is raised higher. One of the most important steps for connecting two columns is the center line of the top has to match the center line of the bottom column. This will assure that the load from the top column is transferred properly to the bottom and down to the footing or foundations. Making the size of the top column matches the bottom will make the field connection easier and minimize erection errors. If you have HSS8x8x1/2 column to column connection, it will most likely going to be welded connection. The fabricator will provide erection aide and the field welders, knowing that the top and bottom column matches will have the ability to visually verify if the connection is correct. The two end of two column pieces to be welded are shop prepped by the fabricator. In the field, all the erector needs to do is drop the top piece in place and weld either full penetration or partial penetration. Other times especially for unequal column connection such as W12x120 bottom connecting to top W10x49, the challenge lies in making the two sizes centered. Often times in this type of situation a steel plate, 2 inches thick or so is added as a cap plate to the bottom piece. This plate will become the base of the top column splice where it will be welded. Since wood is not very strong as column material, a wood to wood column connection is very rare. If it happens it will most likely be bolted connection with steel plates. For precast concrete column, it will be something similar to steel columns as described above. Cast in place concrete column to column connections are straight forward, form and pour with dowls sticking out equal or longer than rebar splice lengths to make the connection.